I got produce from Green B.E.A.N. 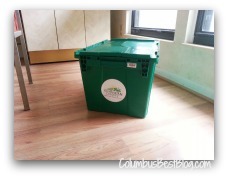 Delivery on Tuesday August 27, 2013… Was ordering produce from Green B.E.A.N. Delivery like a Farmers Market to my door? Not exactly. Thanks to Green B.E.A.N. Delivery I tried a small produce bin in late August 2013, early September 2013. The price of a small bin is $35.00. That’s fruit and vegetables for two for a week. The PR person who contacted me used the idea that Green B.E.A.N. Delivery is “a Farmers Market to your door.” I like farmers markets. Lots. 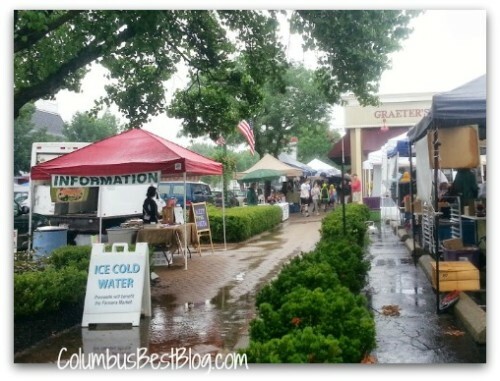 I try to go to the Worthington Farmers Market, rain or shine on Saturday mornings during the summer. Want to try Green B.E.A.N. Delivery? Here’s a code that will get you “$15 Off Your First Order” This Green B.E.A.N. Delivery code is only good for 7 days so do this quick like a bunny. Promo code: “15CBml” This Green B.E.A.N. Delivery code is good for $15 off your first order and expires exactly one week from this post. This promo code is for new members and reactivation only. The Local Bibb lettuce was lovely. I love Bibb lettuce but seldom buy it. The Crimini mushrooms were good. I made a meatless pasta dish with them. I had to “google” what Crimini mushrooms were. Interesting. This week I googled “Shitake” but that’s another story for another day. The Local sweet c orn was just OK. That may be a matter of taste. It was white corn. I did a taste test with some corn from the Worthington Farmers Market at the same meal. Maybe I am just more of a bi-color corn person. Or more a yellow corn person than a white corn person. The broccoli from Green B.E.A.N. Delivery was huge. We had four adults and two kids for dinner over Labor Day Weekend and we still had broccoli for another meal. It was good broccoli. Not the best broccoli I’ve ever tasted, I remember a broccoli back in the 1980s… really. 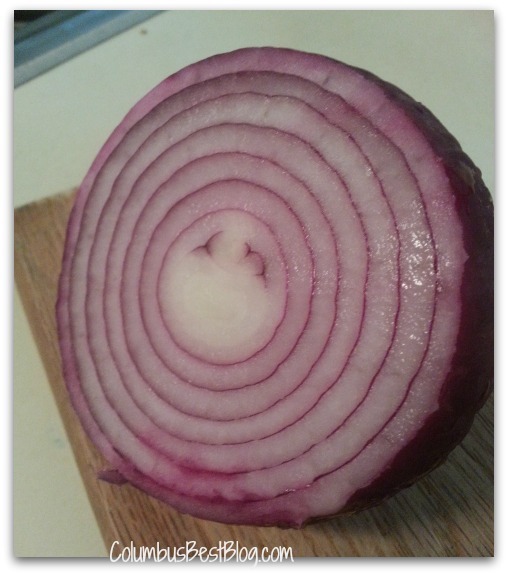 I finally used some of the red onion on Saturday September 7, 2013 frying some up with peppers from the Worthington Farmers Market. Tasty. Very, very pretty too. The onion looked great both raw and sauteed with the local Italian frying pepper from a farmers market a couple of weeks ago. I am less fond of fruits than I am of vegetables. I wish more vegetables were as convenient as fruits to eat. The Plum ooops make that a pluot tasteless. That was the first pluot. Pluot #3 was more ripe or something, details below. The pears were good. We had Bartlett pears from Kroger too. The Green Bean Delivery pears were smaller. Both the Green Bean Delivery and the Kroger pears were very tasty. The Wikipedia listing for ‘Pluot’ says how said how sweet and wonderful the flavor was. I had bought plums a few weeks ago at the Worthington Farmers Market. They were smaller and darker and had a lot of plum flavor. My first “Pluot” was a disappointment. It was juicy but flavorless. The second “Pluot” or interspecific plum I ate was fantastic. Sweet and juicy, it was what I’d hoped for after reading about how good pluots taste on Wikipeida. The pluot or interspecific plums #2 and #4 were eaten by someone else (two different people actually.) I tried to discuss what the pluots (or interspecific plums) tasted like to them with limited success. Neither waxed poetic about the taste of the fruit. I had NOT given a lot of thought to the fact that Green B.E.A.N. Delivery is organic produce before saying yes to ordering a $35 produce bin. It was free to me. Thank you to Green B.E.A.N. Delivery. 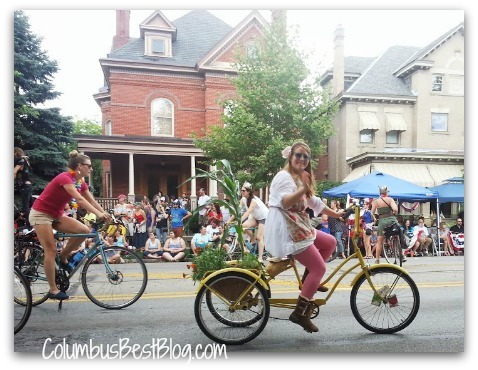 Green BEAN Delivery is @GreenBEANOhio on Twitter. I thought of a “Farmers Market to Your Door” being Local food. I was not really thinking “Oh goody organic food” not that I have anything against organic food. I buy organic food and non organic food at the farmers market and in grocery stores. Honestly though I usually will choose something non organic over the organic product because of the price. I think it would be “peachy keen” if all food was organic… Especially for the farmers and gardeners health. I am not necessarily convinced that food grown non organic is in any way bad for me. I was thinking of the Green B.E.A.N. Delivery food being local. Or more of the Green B.E.A.N. Delivery produce being local. I was thinking the Green B.E.A.N. Delivery food would all taste super dooper fantastic… Nothing tasted bad but I have to say I was disappointed by a couple of the Green B.E.A.N. Delivery produce items in the first bin. That can happen at the grocery store or a farmers market as well. The first cantaloupe I bought at the Worthington Farmers Market this year was GREAT. The next one was not as satisfying. A mini watermelon from the same Worthington Farmers Market stand was fantastically sweet and rich tasting, better than anything from the grocery store or the second bin from Green B.E.A.N. Delivery that we received this week. *Organic Raspberries they were gone by the next day. Second Green Bean Delivery September 3, 2013** we got more raspberries. Gone in less than 24 hours. The raspberries were good. Every bit as goods as when we get the same berries from Kroger. ** Green B.E.A.N. Delivery : The rest of the story on ColumbusBestBlog.com Stay tuned to this station for more of my experience with Green B.E.A.N. Delivery later this week. I am NOT sure I read everything I should have read. Or did all the steps in the right order to make the experience of a Farmers Market to your door everything it could have been. Next post: Tickets to See Billy Currington in Columbus!